By the generous permission and encouragement of Pastor Lang’s family, Emmanuel Press has brought Paul H. D. Lang’s Ceremony and Celebration back into print. It was reprinted by Redeemer Press in 2004 but was quickly snatched up and has been sold out for several years. Several months ago, we also added Piepkorn and McClean’s The Conduct of the Service (published by Redeemer Press) to our collection. Both of these books instruct on the actions and words in the liturgy, yet each has a specific focus. The Conduct of the Service focuses on the role of the pastor (and others who assist in leading worship) in the Divine Service according to the General Rubrics that govern all of the hymnals of the Lutheran Church—Missouri Synod since TLH. 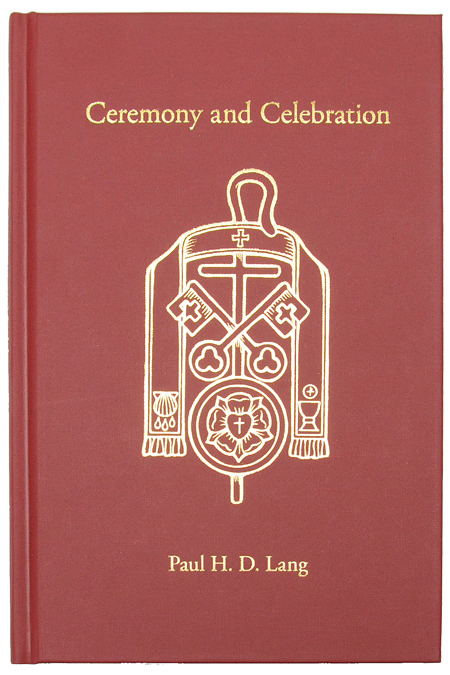 The broader scope of Ceremony and Celebration includes liturgical definitions, the role of the clergy, the role of the laity, liturgical music, church architecture, sacred vessels, furniture in the chancel, the liturgical year, and the liturgical ceremony within our Lutheran heritage from the time of the Reformation. As noted in the Preface to Ceremony and Celebration, there is “a pious desire of both pastors and parishioners to be reverent in worship. That is the genius of this little book: It speaks to all participants in the Divine Service, not just pastors and theologians.” The Divine Service is where Christians gather around Word and Sacrament. Its liturgy provides the structure for keeping Christ as the central focus. The words, music, actions, and physical elements of the Divine Service all play a role in the liturgy. Pastors and parishioners join together to receive God’s gifts, each playing a distinct yet integral part as defined by the liturgy, in accordance with God’s will (Heb. 10:25; 1 Cor. 14:40). Ceremony and Celebration is an excellent resource for anyone who wants to better understand why we do what we do in the Divine Service. Understanding what is going on around us increases our appreciation for and insight into the details of the liturgy. This entry was posted in Latest News and tagged Ceremony and Celebration, Paul H.D. Lang. Bookmark the permalink.